Doesn't seem 5 minutes since Jack started taking Jujitsu lessons at school with the brilliant Activ8 and today is his grading already. Having done that I was mentally willing him on to come out of his grading with a white belt (or at least the order form for one) but knowing he would be gutted because he LOVES his red belt, red's his favourite colour! I've tried to hard to encourage him without pressuring him. I didn't want him to fluff it because I put too much pressure on him, but didn't want him to think I didn't care if he did well. To be honest he's very lucky to be at his grading today at all. Not because he's no good at Jujitsu (his sensei has been telling me does well) but because he's been a right royal pain in the backside for the last week. But he has been granted permission to go. I'm gutted that parents aren't allowed to go and watch the grading. The official line is that there are so many people who want to go that it gets over crowded, and having family and friends around can be distracting for the kids, especially the younger ones like my Jack. Although having spoken to some of the other parents who have been going for a while it was more to do with some groups of parents not having the courtesy to shut up and let other peoples kids get on with their parts, so all parents were banned. I think this is a very sad situation because I would have LOVED to see my lad do his thing, and I would have been respectful to the other kids too. However, parents ARE allowed to the presentation afterwards! 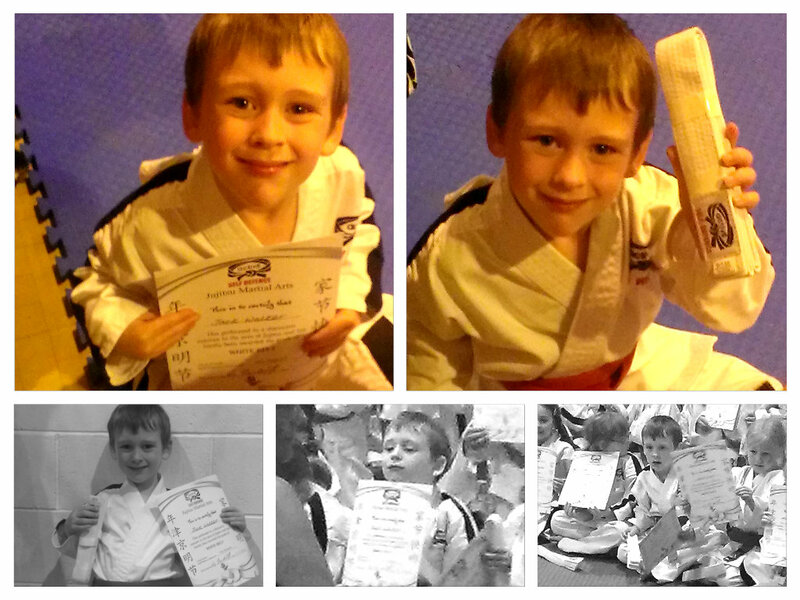 We were thrilled to see him sat on the mat waiting for his certificate and belt! Even if he did look a little sad and worried because he thought he had lost his bag (it was safe at the back of the hall) Some of the older kids did a demonstration of some of the moves they have been learning. And I am very proud to say that Jack passed his first grading and is the proud owner of a White Belt.